Simon Browne is an Assistant Professor in Music, and instructor of viola and violin, at the University of Trinidad and Tobago’s Academy for the Performing Arts. He was a principal violinist with Northern Sinfonia - the premier chamber orchestra in the UK - for ten years, where he gained a reputation as a fine interpreter of Baroque and Classical concerti. In 2012 Simon was invited as guest assistant concertmaster of the New Zealand Symphony Orchestra, leading the orchestra in concert and recordings. He has also co-led the BBC Philharmonic, Royal Liverpool Philharmonic, and City of Birmingham Symphony orchestras and worked with the Berlin Philharmonic, BBC Symphony Orchestra, Hallé Orchestra, English String Orchestra, Orchestra of the Golden Age and Manchester Camerata. He has worked with many of the world’s greatest conductors and soloists. 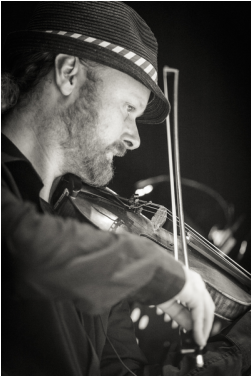 Outside of the classical tradition, Simon has also performed, amongst others, Pet Shop Boys, Nitin Sawney, Joanna Newsom, and Ibrahim Ferrer & the Buena Vista Social Club. Together with the faculty of the UTT Academy and invited local & international guest artists, he performs regular chamber music recitals - on both viola and violin - at the NAPA campus. He has recently been researching old-time Calypso String Band music from 1890s-1930s - painstakingly transcribing sheet music from old recordings - and, together with the UTT faculty, put on a recreation of a 1920s dance band concert earlier this year. Other future projects include a tribute to TT film pioneer and composer, Donald Heywood, and a 65th anniversary concert commemorating Lord Kitchener’s 1950 London Abbey Road recordings. Caitlyn Kamminga currently holds the position of Assistant Professor of Double Bass at the University of Trinidad and Tobago, the Academy for the Performing Arts, where she has focused on fostering creativity through collaboration. Her projects include creating an inter-departmental collaboration, which culminated in the work, The Old Yard: Portraits of Carnival, composed by Adam Walters and recorded by the UTT Musicians, with original poetry by Muhammad Muwakil and photography by Maria Nunes. Following on the success in 2013 of another collaboration with Adam Walters on his work Little Red Riding Hood she is now set to work with Walters again on a new and exciting project Rivers of Freedom. Belorussian born American conductor, clarinettist, and saxophonist Yevgeny Dokshansky has appeared as soloist, chamber musician, and conductor throughout Europe and North America. He presently holds an Assistant Professor position at the University of Trinidad and Tobago. Additionally, Yevgeny is Music Director and Conductor of Ensemble Next Parallel in Washington, D.C. He holds degrees from State University of New York at Buffalo, Indiana University Jacobs School of Music, DePaul University School of Music and he is currently earning Doctor of Musical Arts degree in Orchestral Conducting at the Catholic University of America. Raised in a musical family, Anthony Woodroffe Jr. developed an appreciation for the arts at an early age. During his formative years he entered the Trinidad and Tobago Music Festival on several occasions, winning classes on saxophone, flute, clarinet, and recorder. At the championship level he won numerous titles including best junior instrumentalist and most outstanding wind instrumentalist. In 2006, Anthony enrolled in the BA Jazz Studies degree at Leeds College of Music in the UK where he had the opportunity to play with outstanding musicians, including Omar Puente, Cuban jazz violinist. He recently attended an intensive workshop hosted by Carnegie Hall and led by the incomparable Paquito D’Rivera. He currently holds the title of Senior Instructor of woodwinds at UTT. A first call trumpeter in Trinidad and Tobagao in a variety of musical genres, Rellon Brown serves as lecturer of the Caribbean Contemporary Ensemble at his alumnus, The University of the West Indies and leads his own ensemble, The Dominant Seventh Calypso Jazz Band. Rellon is also the recipient of the 2005 Cacique Award for Most Outstanding Musical Direction for the play The Catalyst. He is currently a member of the National Philharmonic Orchestra of Trinidad and Tobago. Aidan joined the music faculty at the UTT Academy for the Performing Arts in 2009 where he teaches trombone, coaches the Brass Ensemble and Big Band and lectures in Orchestration, Music History and Theory. He has performed with Errol Ince and his Music Makers at three Calypso Monarch finals and performs regularly with the UTT Musicians in their Saturday Campus Concerts Series. Prior to coming to Trinidad, Aidan freelanced in the UK with most of the major symphony orchestras including the London Philharmonic and Royal Philharmonic Orchestras. He worked regularly at the Royal Opera House in Covent Garden and on West End shows such as The Lion King and Mary Poppins and often performed with the BBC Concert Orchestra on the popular radio show Friday Night is Music Night. Seion Gomez started playing the steelpan when he was just nine years old. While at secondary school he participated successfully at junior steelpan competitions and by age eighteen he was arranging for steelbands throughout Trinidad. Seion then furthered his studies through the certificate course in music at UWI before leaving for Northern Illinois University where he graduated in 1999 with a BA in music followed by his MA in 2007. Seion has travelled to many countries as a performer, teacher and lecturer. He has also judged numerous steelpan competitions, both here in Trinidad and Tobago and internationally. Seion currently works with the NLCB Buccooneers of Tobago and Solo Harmonites of Trinidad. In 2008 he became a member of the UTT faculty as one of three steelpan instructors and is dedicated to raising the level of musicianship within the steelpan fraternity of Trinidad and Tobago. American percussionist Brian Kushmaul is the Principal Percussionist of the Chautauqua Symphony Orchestra and Principal Timpanist of the IRIS Orchestra. In Trinidad he has performed with artists including Boogsie Sharpe, Tamba Gwindi, Vaughnette Bigford, Rana Mohip, Redman Watson, and Ernesto Garcia. Brian has held teaching positions at the University of Trinidad and Tobago, University of Louisville and University of Evansville, and has performed with the symphony orchestras of Saint Louis, Columbus, Louisville, Indianapolis, Buffalo, Honolulu, Evansville, and Phoenix. He has recorded with many diverse groups, including AL SUR flamenco ensemble, Central Standard Time Jazz Quartet, IBIS Ensemble, and the IRIS Orchestra. Josh Watkins is currently Assistant Professor of percussion at the University of Trinidad and Tobago. In addition to teaching he regularly performs with the faculty chamber ensemble, UTT Musicians. He has a Master of Music in Percussion Performance from Belmont University Nashville, Tennesse. Since 1998, he has performed and recorded with numerous artists in a variety of arena including jazz, latin, rock, country, world music, steelpan, chamber music, and orchestral music. He is a member of Trinidad All Stars Steel Orchestra and has a strong interest in percussion outreach within Trinidad and Tobago as well internationally. As a guest instructor and artist, he has developed seminars for professional and student percussionists through music stores, camps, and schools.